The leading COBOL application development, deployment, and modernization solution for distributed systems. 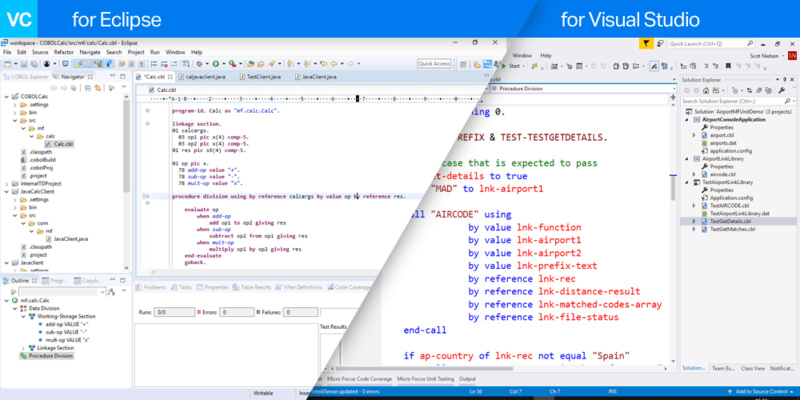 Visual COBOL® provides COBOL development and integration tools – in your choice of Visual Studio or Eclipse – that offer programmers an unrivaled development experience. Use Visual COBOL to help your AppDev teams work better together and deliver new functionality faster to your business users. Visual COBOL for Visual Studio provides advanced COBOL editing and debugging for application developers. Continuous background compilation, auto complete, code analysis, and code search are just a few of the many developer tools available to streamline application delivery. Utilize REST and JSON to build new web services. Create new user interfaces using Win Forms or WPF. 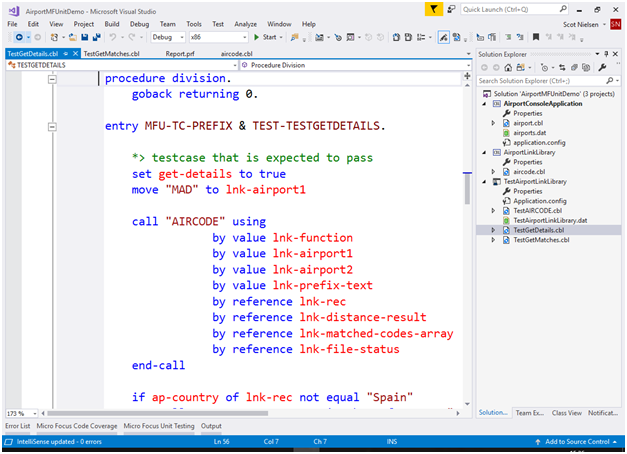 Combine COBOL with C#, VB, and other .NET languages – all within one IDE. 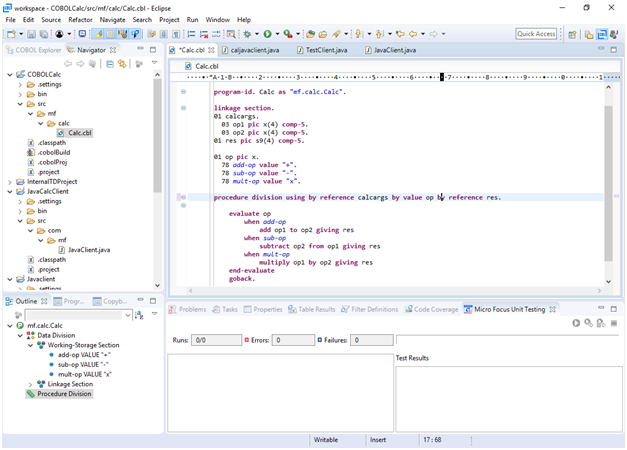 Visual COBOL for Eclipse provides advanced COBOL editing and debugging for application developers. Continuous background compilation code analysis, code search, and remote compile, and debugging are just a few of the many developer tools available to streamline application delivery. Utilize REST and JSON to build new web services. Create new user interfaces using HTML-5. Combine COBOL with Java and other Java Virtual Machine (JVM) languages – all within one IDE. 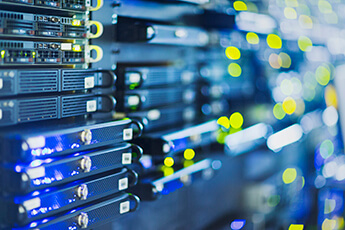 The Micro Focus COBOL compiler and runtime system provides universal platform coverage enabling COBOL applications to be deployed across a range of distributed systems, ensuring compatibility and consistent behavior across different platforms. Standard library routines callable from COBOL applications enable a write-once, deploy-anywhere approach for developers. The latest release of Visual COBOL takes this development and deployment flexibility even further with support for Docker containers. New product packaging options enable Docker deployment to both Windows Server and Linux platforms. Visual COBOL delivers a future proof strategy for application modernization and enabling the porting of business services to Java. Embracing innovation with Visual COBOL® delivers a modern and agile development environment, boosting productivity and performance by 30 percent. Upgrading from COBOL Workbench to Visual COBOL for Eclipse was much easier than I had anticipated. I had expected the need to rework code and was reluctant to make the move. However, the risk of continuing to use older technology, as well as the promise of a modern development toolset with mixed language support, convinced us to pursue the upgrade. It is always our priority to bring together the best in class experience for our application development and management teams. With support for Visual COBOL we have taken our user experience to the next level by providing a well-integrated, seamless development and deployment of COBOL apps to our enterprise-grade platform. Thanks to Visual COBOL, we can now use COBOL code more flexibly as microservices, integrated in a service-oriented architecture, to accelerate business processes. Visual COBOL for Eclipse has helped us reduce technical debt and increase flexibility, preparing us for future business challenges. Today, we use, maintain and update fewer tools, helping developers to increase productivity and deliver state-of-the-art services to staff. The move to Visual COBOL has given us significantly improved graphics and video capabilities; enhanced visualization tools; an online version of the solution, and a much more modern look and feel. We couldn’t believe how quickly everyone picked up on the Visual COBOL potential. Even our Microsoft .NET developers were able to use Visual COBOL within a matter of days as it integrates into their existing development tools. And, the time it takes to on-board new development interns went from many months to just a few weeks. We had not appreciated the difference in user interface, but our developers love the new environment. Code debugging and editing is so much easier for them. We feel there are still many opportunities to be exploited with Visual COBOL, and that is exactly the position we wanted to reach; flexibility and agility to meet any future challenges head-on. We successfully migrated a couple of our applications from aging development and database platforms to a more modern and cost-effective environment using Visual COBOL. The migration effort enabled us to continue to leverage these applications while mitigating risk, managing the TCO of these applications, and modernizing the user interface. 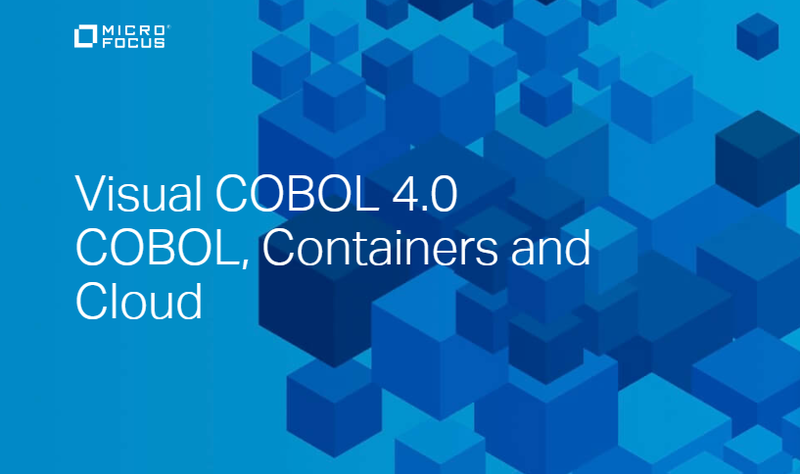 Most organizations today rely on COBOL systems for critical business service delivery but need to innovate faster to address competitive and legislative pressures, meet new customer demands, and enter new markets. By taking the application modernization route, reusing core business systems over other alternatives, companies can take advantage of the latest technology, dramatically reduce development costs, and improve application and organizational performance. Take a closer look at product highlights and technical specifications. Explore how Visual COBOL can address your business needs.